Chances are that if you clicked on this article to read, you probably already know that government and big banks are heavily colluding behind the scenes. In fact, most people know this, even if it is just at a very basic level. Most people also recognize that the big banks played a large role in the 2008 financial collapse, which saw the global economy lose trillions of dollars in wealth. The question is: If it was so apparent that they were heavily involved, then why were no banks or executives criminally prosecuted as a result? Often times in alternative media we talk in general terms, instead of getting into the exact details of legal proceedings. That’s not to imply that there is anything wrong with that, but if we are going to be more effective in winning both the information war and the political action war, we must understand the specifics in order to debate our positions to the fullest extent. In the following piece, we will take an in-depth look into the case of criminal investment fraud brought against Goldman Sachs by the Department of Justice following the 2008 financial collapse, in the hopes that these factual details will arm you with the proper ammunition to hold up in any conversation. Knowledge is power. 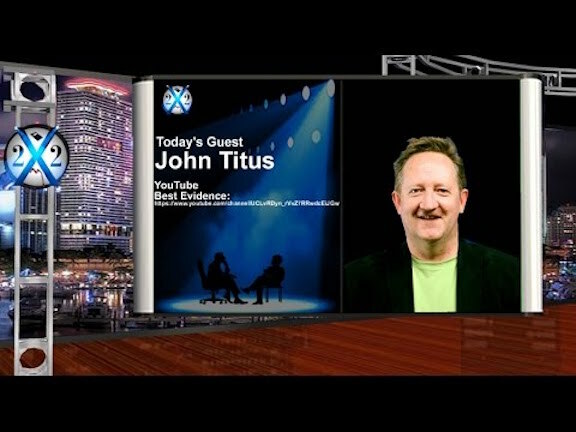 A big thanks goes out to Martin Smith of Frontline for his Investigative piece on the matter called “The Untouchables” and John Titus of the YouTube Channel, BestEvidence, for providing an in-depth look into the case and its documents in his documentary “The Veneer of Justice in a Kingdom of Crime.” Without the amazing work of these two journalistic pieces, especially John Titus, this report would not have been possible. I highly encourage everyone to watch these pieces for further understanding. In order to properly understand the legal case brought against Goldman Sachs, it’s important that one first have a firm comprehension on just how the 2008 Financial Collapse came about. It will give context to the subject and make the case a lot easier to understand. The first major problem was that the real U.S. economy just wasn’t very strong. It’s important to understand that the U.S. economy is largely a product of the petrodollar system, whereas the majority of international trade is done in dollars. As a result, countries send the U.S. their assets in return for dollars that the U.S. simply printed into existence in order to provide liquidity for international trade. The U.S. got very rich as a result of the high price in dollar demand, allowing it to grow and consume at the expense of the rest of the world. Behind the façade of phony wealth is a high level of inequality and a real economy that has steadily decreased over time. This nation’s productive capacity is nowhere near its consumption rate; meaning trade deficits, high debt, and no substantial amount of good paying jobs needed to fuel a middle class. Credit expansion, which is none other than debt accumulation, is a must to keep the party going. Though not as acknowledged by mainstream pundits, the Federal Reserve’s monetary policy of artificially low interest rates for an extended period of time greatly expanded credit markets–meaning loans were much easier to make for banks and loans were much cheaper to obtain for the average American. 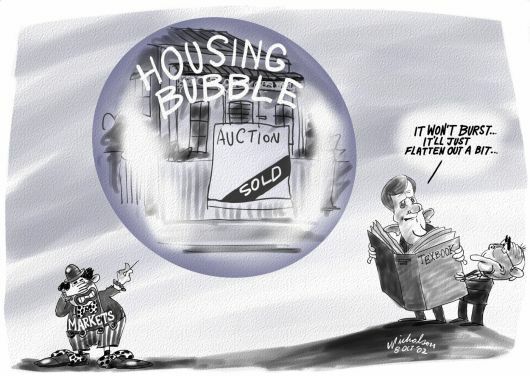 As a result, large equity bubbles were created, largely in housing, which was financed on the consumer side by debt, and on the business side by credit expansion. Way too much “risky debt” had entered the system, especially considering the fragile economy of the U.S. Prices go up as credit expands and inflation rises; but that isn’t real wealth. This was also coupled with the fact that many of these mortgages were adjustable rate mortgages or “0” Down Payment. So when those rates eventually adjusted and went up, the piper had to be paid and people simply didn’t have the means or finances to pay them back. The credit card maxed out and work wasn’t available, especially for the inflated prices. The real economy simply didn’t match the credit market. The other major problem was that regulation was being trampled on, causing a massive ramp up in predatory lending. Everyone was getting a loan, even if they didn’t have the adequate means to pay it back. Underwriters, pegged with the job of assessing the risk of buying loan portfolios, were told that virtually anything could pass, such as a waitress claiming to make 12k a month, taking on half a million dollar mortgage. This lead to a massive increase in sub prime loans, also known as: extremely risky loans. Mortgage companies were then selling these loans to the Big Banks for a fee, who then packaged these loans together and sold them as securities, mainly Collateral Debt Obligations (CDO) and Mortgage Backed Securities (MBS). The ratings agencies gave these securities triple A ratings, which were then sold all over the world to investors as great assets to have in your portfolio. A huge trading market (derivatives market) was started for these CDO’s and MBS investments, with profits to be made on every sale. The problem was that these assets were subprime-garbage, and the banks knew it. Eventually when consumers couldn’t pay back their mortgage loans and credit dried up, all those securities blew up, destroying portfolios all over the world. 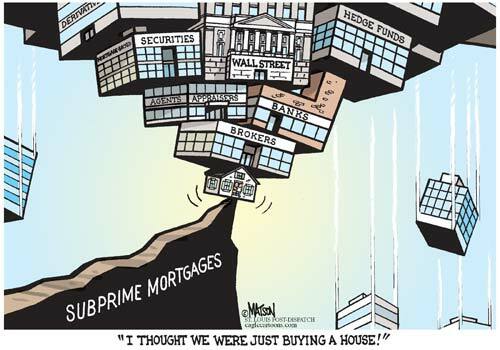 It was truly a global financial crisis, which stemmed from the housing equity bubble due to subprime lending. Finally, the last problem is simply one of information and ethics. None of these problems could build up in the way that they did, and are currently doing, if the public had access to quality information and people acted in just, honest ways. We don’t often talk about these aspects as root problems, but instead focus on details in the data and law. While those factors are just as important, focusing on the population getting current, unbiased information and promoting a culture of love and ethical behavior go a long way in making sure that these kind of deceptive scams are not allowed to happen. In the end, one can only respond to problems based on the accessible information, as well as the ethical compass which guides a person’s interpretation and vision. Now one would think that those responsible would go to jail, especially after a crisis of such massive fraud and corruption. On the surface level, around 2-3 thousand loan originators who worked for mortgage companies went to jail, yet behind the scenes, no bankers went to jail at all. Basically, the justice system caught 2-3 thousand little minnows, but failed to touch a single big fish up the chain. Though the banks didn’t issue the original loans, it’s highly unlikely that such a large amount of subprime mortgages would have been created by mortgage banks if the big banks were not there to buy them up afterwards. So in reality, the big banks were some of the main culprits to the crisis, and definitely needed to be prosecuted. The question is: Why did the U.S. government not prosecute them, despite the increased allocation of resources to do so? Due to the public backlash after the 2008 Financial Collapse, the U.S. Government was forced to develop a task force to investigate and try to prosecute those responsible. The Security and Exchange Commission (SEC) investigated and eventually sued Goldman Sachs for “defrauding investors by misstating and omitting key facts about a financial product tied to subprime mortgages as the U.S. housing market was beginning to falter.” The Senate also took action under the Permanent Subcommittee on Investigations by investigating the causes of the 2008 Financial Collapse. Right at the heart of their report was Goldman Sachs, dominated 40% of the 640 page report. According to the Senate report, Goldman Sachs had defrauded investors by sniffing out bad debts, packing them as securities, and selling them as quality assets, while at the same time, betting against those assets to fail. This was noted in the Hudson program, which was a 2 billion dollar CDO that Goldman had created and marketed to investors. They even invested 6 million dollars in the Hudson program in order to advertise to investors how they were invested in its success. They also claimed these securities were “sourced from the streets,” meaning they were bought off other brokers, when instead, it was Goldman who has developed it themselves. What wasn’t disclosed however, was the 2 billion dollar short position Goldman took on those assets, basically betting large on them to fail. Goldman pocketed 1.7 billion dollars on the Hudson deal when the toxic assets blew up, all at the expense of the Hudson investors. This is securities fraud 101; they sold something that was rated triple AAA when in fact, they knew it was not. The problem is that neither of these defenses are legally viable in an SEC case. In the argument of sophisticated parties, which is a very loose legal term that basically says in a complex transaction both parties must be smart enough to go in at their own risk, the law states that in an SEC case, “reliance is immaterial no matter the sophistication or knowledge of the customer or tippee.” As for the adequate disclosures agreement, which is meeting the minimum essential data disclosure requirements, the Supreme Court ruling states that “conduct itself can be deceptive without oral or written statements at all.” As a result, Lloyd Blankfein’s defense to Goldman Sachs securities fraud charge had no legal merit at all, which is why they ended up having to pay the largest fine ever issued by the SEC of $550 million dollars. This was supposed to make the case go away for Goldman Sachs, but many wanted criminal prosecution and rightfully so. The Senate got involved again, this time with the Senate Judiciary Committee, particularly Ted Kauffman, who got interested in why the Department of Justice (DOJ) had not yet criminally prosecuted any major banks or executives for what they had done. During a judiciary hearing, Ted Kauffman probed the Head of the DOJ’s Criminal Division, responsible for bringing prosecution, Lanny Breuer, about why the Justice Department didn’t make any prosecutions. Breuer said his efforts to prosecute were being thwarted by the high legal standards of the law, pointing to the same two legal defenses Lloyd Blankfein had stated of sophisticated parties and adequate disclosures. Basically, Breuer was arguing that they prosecuted all cases of security fraud, but didn’t ever consider fraud cases of deceptive concealment. However, the Goldman case was for concealment of fraud, where the law states “No written or oral proof is needed.” The government already knew Goldman had a massive short position on the Hudson deal, which it put together itself. The case should have been a lay-up, just like the SEC case, but the outcome was very different. 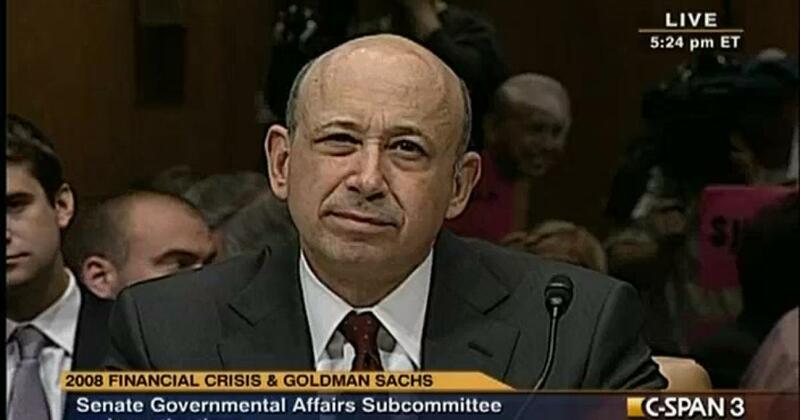 A few months later, in August 2012, the DOJ decided not to criminally prosecute any of the Wall Street banks or executives for the crimes they had committed, despite the mountain of proof the government had gathered, and despite the fact that they used the same legal errors that Blankfein tried to peddle, which had no legal merit. They also failed to prosecute UBS for its admission to criminal rate rigging four months later, which quickly coined the belief that these banks were not only “too big to fail,” but the were “too big to jail.” The question is why? This basically showed that both the top two guys in the Department of Justice, most responsible for bringing prosecution, had intimate business ties to Goldman Sachs. 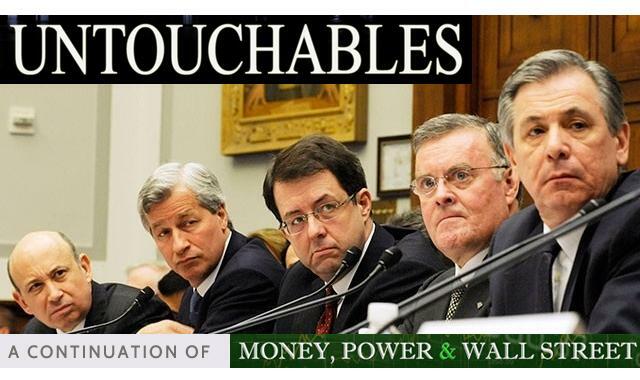 Then in 2013, after they had decided not to prosecute, PBS aired a Frontline Investigative Report called “The Untouchable,” which centered around “why Wall Street’s leaders had escaped prosecution.” In the report, reporter Martin Smith asked Lanny Breuer why they didn’t prosecute any of the bankers. Once again, he gave three reasons, all of which were legally false according to case law. 3) Claim: The other side of the transaction relied on what was said. Stating that they were sophisticated parties who acted under their own will. Law: In a criminal fraud case the government is never required to prove that one party to a transaction relied on the word of another. If it did, it would give a license to lie to the seller when dealing with sophisticated buyers, which makes no logical sense. So obviously there was no legal standing for this reasoning. Who were the sophisticated parties that gave Breuer the legal opinion not to prosecute and why? Basically, he said that prosecuting global banks and executives would have large “collateral consequences” for society. The question was who were the “sophisticated parties” giving him advice on the dangers of collateral consequences. In the speech, he seems to come right out and say that it was “CEO’S, defense councils, and economists” who had done so, yet when asked about this by Frontline, Breuer said that it was “regulators and experts” who had helped him make that decision. Ironically, Lanny Breuer announced his resignation from the DOJ the day after “The Untouchables” aired and joined none other than Covington and Burling, where he had a 4 million dollar paycheck waiting for him upon arrival. After the Frontline piece aired, Congress began investigating who the so-called “experts and regulators” were that had advised Breuer not to prosecute due to collateral consequences. 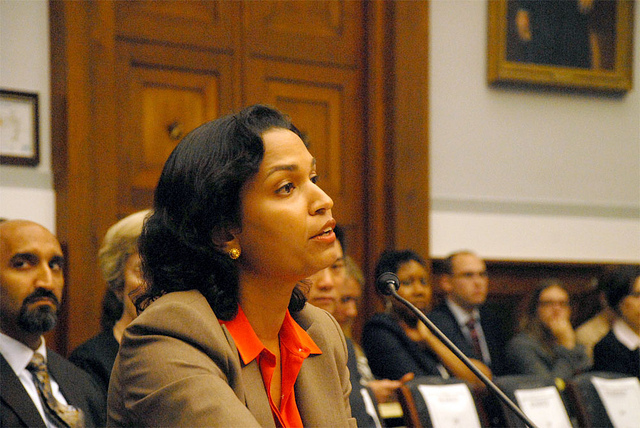 Since Breuer had resigned from his DOJ position, when the senate conducted another hearing following the airing of “The Untouchables” to discuss the collateral consequences and regulators, the DOJ had Mythili Raman as their representative to the case, despite having Deputy Attorney General James Cole as the original representative. Not surprising was that she just so happened to be right under Lanny Breuer at the DOJ (Assistant Head of the Criminal Division). It was her job to explain the collateral consequences they left out in the previous hearings and identify the regulators who had provided sophisticated opinions. Essentially, it’s only an option and not “required,” like she had stated. Essentially, she had claimed that it’s mandatory for prosecutors to consider the collateral consequences of criminal banks, yet optional when deciding whether to prosecute criminals of financial fraud. This is ridiculous logic, yet Congress didn’t say anything about it, basically hinting to their own complicity in the matter. She also claimed that she couldn’t reveal the regulators because there were ongoing investigations, as if their names were some type of secret. In reality, they never met with any regulators at all, as there are no documents to show for it. After the investigation, Raman also joined the infamous law firm, Covington and Burling, which Eric Holder and Lanny Breuer both left the Department of Justice to go back and work for. This is the same law firm that represents Goldman Sachs… how ironic. 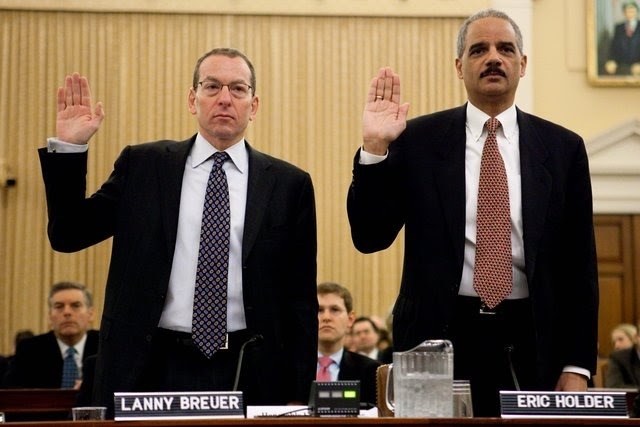 Breuer couldn’t point to any investigations because there were none, Raman couldn’t point to the regulators because there were none, and Holder couldn’t point to any prosecutions because there were none. One hidden note that was picked up by John Titus was that there was a silent partner in the case, Daniel Suleiman, who worked in the DOJ at the time and now of course at Burlington and Covington. Suleiman was actually a silent partner in the case, being that Breuer had assigned him as the co-leader of the “investigation” into Goldman Sachs, despite the fact that he had never prosecuted any investigation before. It became pretty clear that those in the DOJ were not working on behalf of the government and the rule of law, but instead were working on behalf of the Big Banks, which they had intimate business ties to in their professional careers. Just a year ago, a Freedom Of Information request was sent out based on information regarding “the banks of Breuer’s calendar.” Only one document turned up, which was a meeting notice between Goldman Sachs and Breuer’s team at the DOJ, which was titled “Anti-Fraud Task Force.” The meeting took place after Goldman learned the SEC was preparing a case for securities fraud, but a month before Lloyd Blankfein and Breuer were set to testify on the issue. The names of Goldman’s people are redacted from the document, but Breuer, Raman, and two other lawyers with private professional connections to Goldman Sachs, one which also works at Covington and Burling, were listed are on the document. Though there are no statements about what happened in the meeting, it’s pretty easy to speculate that with all the personal business connection going on between the two, covering up the case was probably at the top of the list. What’s more sad, is that on April 11th, 2016, Goldman Sachs actually admitted to the DOJ that it “had misled investors about the mortgage-backed securities while knowing that the repackaged loans were indeed riskier than what they had told investors. Goldman also agreed to say the bank had failed to do its due diligence.” In the end, despite paying out multibillion-dollar settlements for their fraudulent activities, the banks avoided any criminal prosecutions. It was a true breakdown in the justice system of the United States. It seems obvious now, that the Big Banks/Goldman Sachs, used the threat of collateral consequences as the economic legal argument for avoiding prosecution, despite having no legal justification to do so. As a result, the Big Banks basically showed how they are more powerful than the U.S. justice system, as they were immune to prosecution despite being proven to have broken the law. As John Titus argues, this is basically a Coup D’état, where the rule of people is more powerful than the rule of law. This is commonly understood, but now it should be cemented as actual legal precedent, rather than pure speculation. The question now becomes: What are we going to do about it now that we know what actually happened? The burden is now placed upon us to wake up and fight back. We can beat them at their own game, but first we have to study their moves, so next time they try to pull the same stunt, we’re ready. Remember always, Knowledge is power, but only if we put it into action. Let us now become wise and take action!